However, there is a problem, if you are using Server 2008 there’s a hot-fix (and you need to make the following change as well) I’m on Server 2012 and mine was failing. Create a new 32bit DWORD Value called DisableRenewalSubjectNameMatch and set its value to 1 (one). 2. Also ensure the certificate that you are using or NDES, has the following settings, here I’m using a custom template called NDESTemplete, If you are using the default one it will be called ‘IPSec (Offline request)‘. 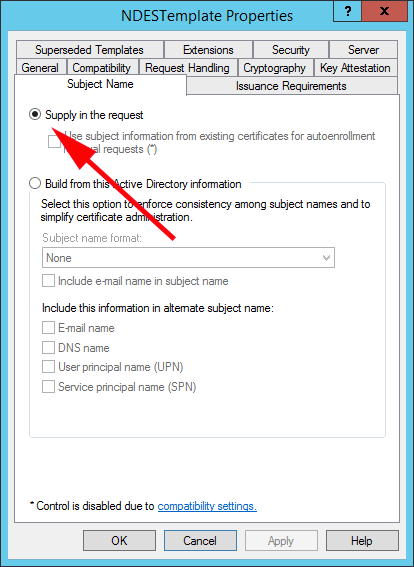 On the Subject Name tab make sure ‘Supply in the request’ is selected. 3. 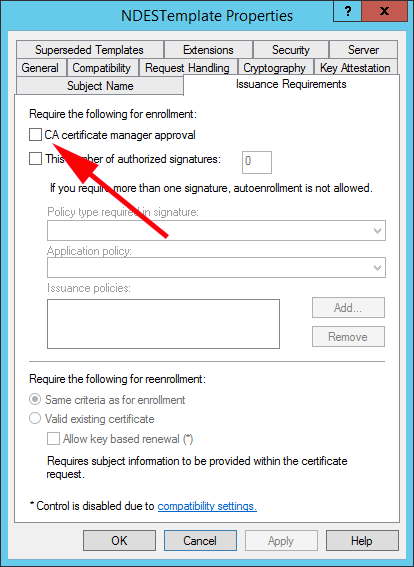 On the ‘Issuance Requirements’ tab, ensure ‘CA certificate manager approval’ is NOT selected.